The Shih Tzu is a small but sturdy dog with a lush, long, double hair coat. This breed's alert, confident, playful and courageous demeanor may be interpreted as stubborn and outspoken. In part, this may be due to its long history as a lap dog to nobles. The Shih Tzu, when properly trained and cared for, can make a wonderful companion. Its small size makes this breed ideal for apartments and small homes. Just be prepared for some snorting and snoring; the Shih Tzu is considered a brachycephalic breed because of its head shape and short "smooshed" face. Overall, most owners of the breed will tell you that the Shih Tzu is truly a lovable dog breed. Coat and Color: Long double coat in nearly any color, most commonly in black, white, blue, gold, liver, or combinations. The name Shih Tzu originates from the Chinese word for "lion" because of the breed's lion-like appearance. Evidence of the Shih Tzu 's ancestors can be traced back to ancient breeds, particularly in Tibet. DNA analysis shows the Shih Tzu, like the Lhasa apso, is a more direct branch from the wolf than many other dog breeds. The exact origins of the Shih Tzu as a Chinese royal house pet is hazy, with different dates offered over the past 1100 years. The breed became known as a noble dog of China, notably as a royal house pet to the Ming Dynasty from the 14th to 17th century. They were favorites of the Empress T'zu Hsi in the late 1800's. The Shih Tzu has always been known as a house pet and lap dog, never having been bred for any other known purposes. This differentiates the breed from the Lhasa apso, which served as temple guards. Perhaps this is why it remains, to this day, one of the most pampered and popular of the toy breeds. The Chinese royals didn't allow the dog to be traded outside of the nobility. It was not until about 1930 that the first Shih Tzu 's were imported into Europe. They came to the U.S. after World War II. The breed was recognized by the American Kennel Club (AKC) in 1969. The Shih Tzu 's hair coat grows continuously. Many owners choose to keep the hair trimmed short, making it appears somewhat curly and fluffy. Other owners prefer to keep the coat long and luxurious. Because of this coat type, routine grooming is an absolute necessity. The Shih Tzu should be brushed once or twice per week (up to once daily if the coat is kept long). Haircuts may be necessary every several weeks. When the facial hair isn't trimmed, it can irritate the eyes. This is why you may see Shih Tzu 's with a topknot or a bow to manage their hair. The Shih Tzu is called a hypoallergenic dog breed due to their low shedding pattern. The loose hairs are more likely to be retained in the coat rather than spread allergens in the air. However, be aware that the allergens that trigger dog allergies are present in the dander and saliva, so there will still be some present in the environment around the dog. If you are sensitive, it is wise to spend time with a Shih Tzu to see if this breed provokes your allergies or not before adopting one. The dog's nails should be trimmed about once a month. Help your dog with oral hygiene by brushing its teeth regularly. 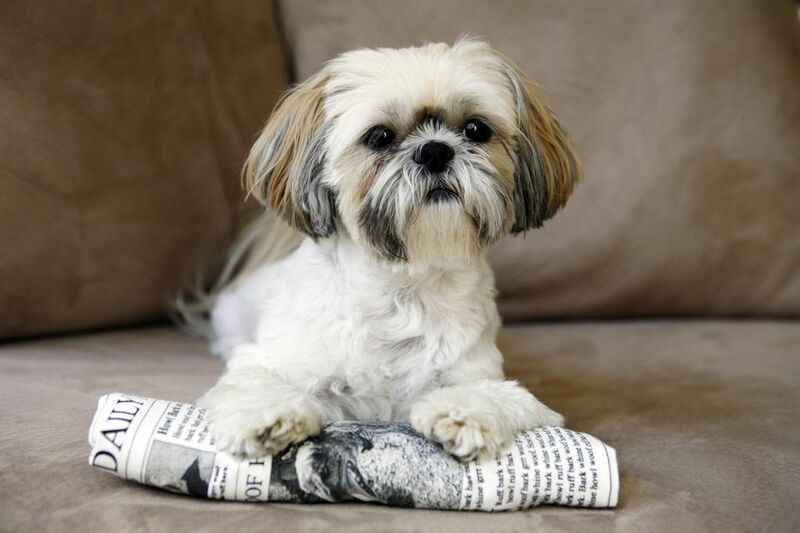 The Shih Tzu has a moderate energy level and needs routine exercise. Daily walks and fun activities like games can help keep your Shih Tzu mentally and physically stimulated. They adapt very well to apartment living as long as you give them this active play. They do not do well in the heat due to their flat faces and can get heat exhaustion, so take care in hot weather. Shih Tzu can be difficult to housebreak and you will need to be diligent in training this dog from a young age. They can be trained to use a litter box indoors. Be aware, however, that they tend to eat their own and other dog's turds, so you will need to keep your dog's area clean and be aware of this on walks. This breed gets along well in a multi-pet household with other friendly dogs and cats, especially if they are raised together. They are great with children as long as the child is old enough to handle a dog gently and respectfully. As a small dog, the Shih Tzu can be injured by rough play or by being carried around and dropped. As a small dog, a Shih Tzu needs only 1/2 to 1 cup of dry dog food per day. The amount depends on the dog's age, activity level, size, and health factors. It is important to monitor your dog's weight and take action if you see the dog is becoming overweight. Discuss the appropriate nutritional strategy with your veterinarian to get recommendations. If you think the Shih Tzu is the right dog breed for you, be sure to do plenty of research before adopting one. Talk to other Shih Tzu owners, reputable breeders, and rescue groups to learn more. Explore the variety of dog breeds out there. With a little research, you can find the right one to bring home.